We feel confident saying that no one has taken the time to develop the kind of training program we have, combining both a conceptual framework and practical experience into material that prepares businesspeople to succeed in China. The graphic to the right illustrates how we organize our material. We begin with the Local Conditions, understanding background information on China and how China is different. This knowledge forms the foundation for understanding most of what is important about doing business in China. The biggest mistakes companies make in China, which we call the “Killer Mistakes,” are having the wrong strategy, choosing the wrong partner, and managing poorly. Understanding China’s local conditions is critical to avoiding these mistakes. We provide practical advice and best practice approaches to avoiding these mistakes. Beyond the big mistakes, even day-to-day tactical issues can be challenging because China is different. We have material that addresses specific functional disciplines and can tailor such material to any given company. Lastly, understanding the local conditions is also key to understanding events and trends that can impact risk, opportunity, and future growth in China. We help clients understand how to plan based on what is happening in China. Learning how China is different from the US is the first step in determining whether and how to adjust your approach to doing business there. Your first priority is to avoid big mistakes, which in China are usually those related to strategy, management, and partnership. Mistakes in these areas are almost always a result of having failed to understand and adapt to local conditions. Once you get passed the big mistakes, you still have innumerable smaller issues to master. Almost everything you do will have at least a minor twist to it. Some things will barely resemble what you are used to back home. Again, knowing the differences in the local conditions can help. Building on the local conditions lessons we help companies understand tactical issues like banking, sourcing, HR, etc. Is China changing course? Is the latest regulatory announcement significant or just a blip? How serious are the risks to growth? China is always changing. There is no shortage of opinions as to whether China will continue to grow or fall apart. Part of a manager’s job is to respond to and anticipate change. Doing so also starts with understanding the local conditions in China, particularly how China got to where it is today. Our training can be geared for a variety of audiences including executives, professionals, middle managers, and expatriates. To give businesspeople the knowledge necessary to be more effective in China, including making their own decisions and taking actions themselves. These days nothing enhances a resume like international experience. No country is higher on the list than China. Of course this is because, in an increasingly global economy, the ability to be effective in the largest high-growth economy in the world is a necessity, not an option. Just like a developing professional or manager should be able to read financial statements, they should also understand what makes China different and challenging and be able to discuss China intelligently. For companies trying to prepare their next generation of leaders for the tomorrow’s most important challenges, The China Learning Curve’s training program is an excellent addition your professional development plans. Unique aspects of China Learning Curve Training We think we have the most impactful China training program available. Below are some of the aspects of our program that make it unique. By starting with the local conditions we build an excellent foundation upon which much other knowledge can be built. This is highly unique and yet essential for developing genuine competence in China. The chart outlining our curriculum gives an idea as to the breadth of our material. We have direct experience in many areas. In addition to addressing strategy and management, we can tie broad concepts to specific functions while also providing function-specific knowledge, guidance, and best practice recommendations. Although our material teaches high-level concepts, everything is communicated via real world experience. We make the theoretical as tangible and relatable as possible which helps to engage businesspeople looking for practical, not just theoretical, assistance. Some topics, though perhaps important, can’t help but be dry. China is not such a topic. So different and dynamic, China provides the opportunity to present material that will genuinely pique curiosity, engage interest, and make people think. Even more so when in the hands of an experienced, dynamic communicator like Dan Joseph. 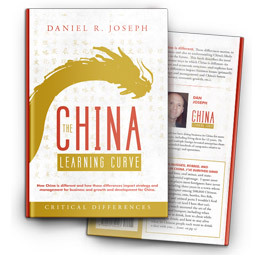 Dan’s ability to weave real world examples in with his material allows him to not only communicate lessons more effectively but, by relating some of the adventure and curiosity that is China to audiences, to hold their attention and provide a unique and memorable learning experience. Beyond strategy and management, below are examples of specific management and functional issues we help companies address via training.